Korean manufacturer Samsung continues to step on the gas and now presents another smartphone for the Galaxy A series. And this also comes with an XXL display and some "premium features". Samsung is getting ready to take on the growing competition from China and is restructuring the Galaxy A series for this purpose. After the South Koreans already introduced the Galaxy A30, A50 and Galaxy A10 for India, now the Galaxy A70 follows. The drive is an Octa-core chip (2 x 2.0 GHz and 6 x 1.7 GHz) with either 6 or 8 GB of RAM and 128 GB expandable memory, which is not described in detail. The energy source is a 4,500 mAh battery that supports Super Fast Charging with 25 watts. The operating system is Android 9 Pie, which Samsung, of course, uses for its new One UI. Samsung's "premium features" for the Galaxy A70 also include a fingerprint sensor integrated into the display and face recognition. However, the sensor will probably only work optically and the face recognition only works in 2D. When will the Galaxy A70 be on the market? 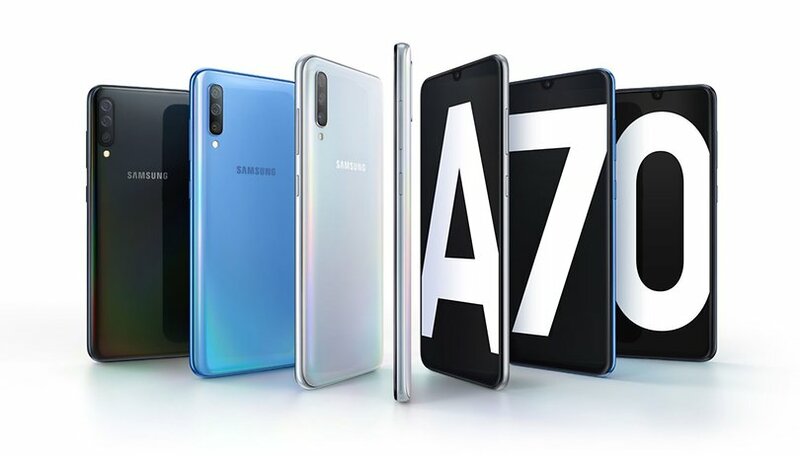 The Galaxy A70 is available in Coral, Black, White and Blue. So far, Samsung has not yet commented on the price or launch of the Galaxy A70. But we expect the South Korean manufacturer to make up for this at the event on 10 April. The presentation of the Galaxy A90 with a pop-up camera is also expected there. Was present at the Samsung Sales Event in Belgium yesterday. I saw the A70 amongst other devices.